"Success is a Process, a quality of mind and way of being, an outgoing affirmation of life"
To be disciplined and methodical (process driven). To follow a truly holistic approach and to ensure that all elements of the estate (e.g. investments) are properly examined. I.e. ensure that all elements of the estate plan receive adequate attention. To critically assess the current estate plan’s effectiveness in achieving the stated objectives. To highlight gaps in the current estate plan and set about closing those gaps. To project the taxes (CGT and estate duty) payable on death. To ensure a uniform client experience regardless of who looks after the client. Understanding the clients medium term financial needs and goals (e.g. where they wish to retire). Understanding the family structure, and the high level objectives of the client. A review of the current will and fiduciary structures. An critical review of the current assets in the estate. The estimation of the current CGT and estate duty payable. The assessment of the adequacy of the cash resources to pay estate expenses, taxes and living expenses of surviving spouses. The next step in the process is the design of a high level estate plan. This will involve recommendations around the will, trusts etc., and the determination of the timelines for each step in the process. The next step is then the actual implementation of the plan. This involves redrafting the will, establishing trusts etc. to achieve the objectives of the client. This will include routine matters such as the ongoing administation of family trusts and compnaies, including elements such as using the annual donation of allowed amounts to trusts or beneficiaries, investment reviews and tax and accounting records. The final step in the process is to continually review the estate plan to ensure that it remains optimal (e.g. to cater for changes in legislation). We firmly believe that proper estate planning takes time. 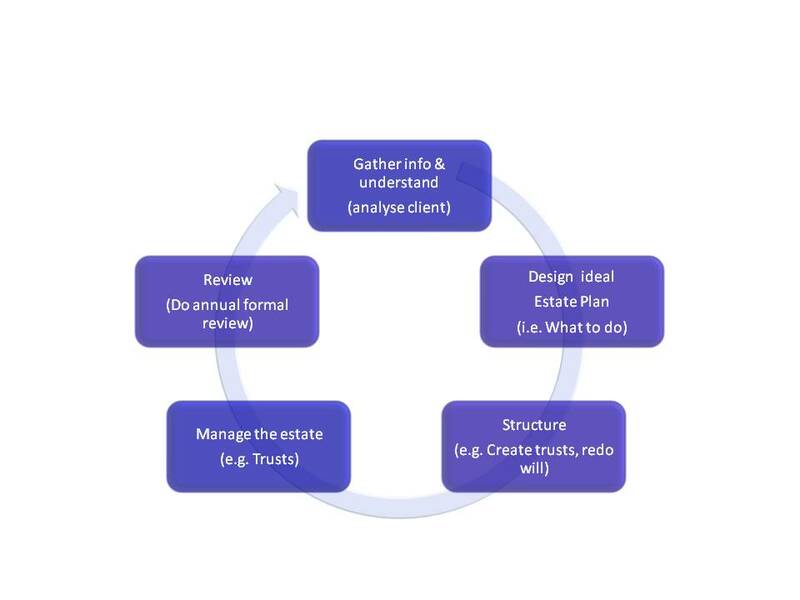 We feel it critical that both the client (and family) and the estate planner/s devote adequate time and resources to properly understand the circumstances, objectives and needs, and also commit to systematically closing any gaps in the greater estate.